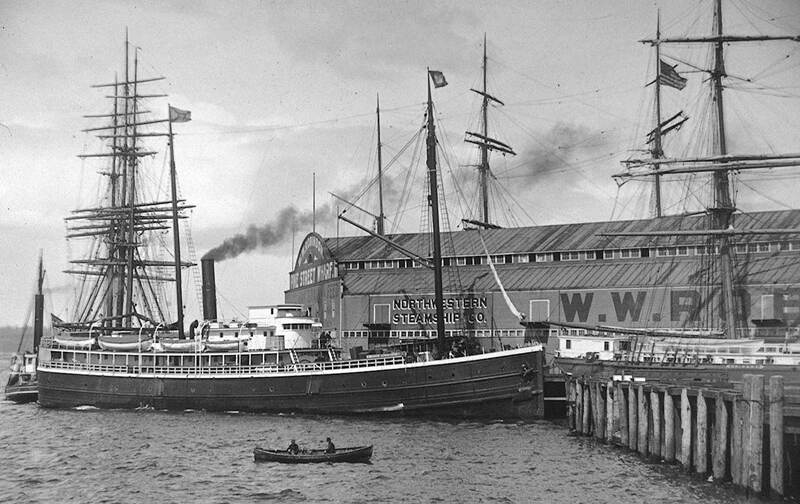 In the gaggle of vessels hugging the sides of the Pike Street pier it is the 1200-ton wooden steamship Santa Ana that shows a full profile. 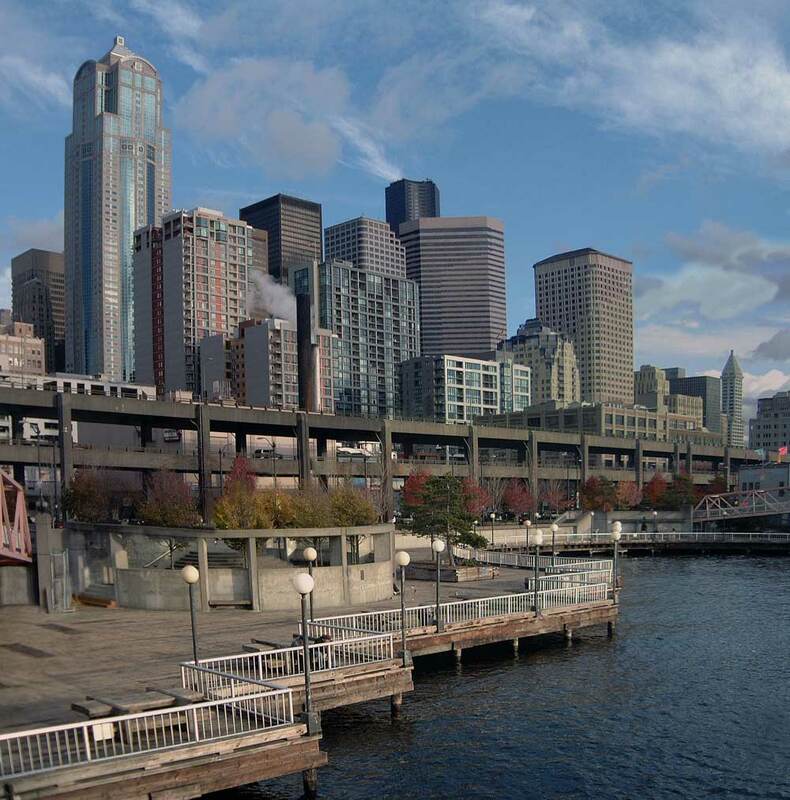 She may be backing out of the slip between the Pike Street and Schwabacher’s piers. However, there is a chop on Elliot bay and the black smoke from her stack may be pushed east by a breeze off of Elliott Bay. 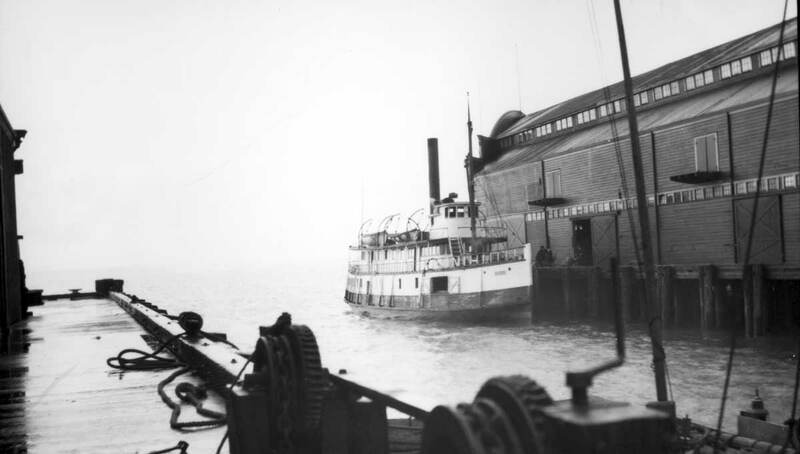 Perhaps the Santa Ana is coming home from Alaska to her Northwestern Steamship Company (the name is written on the pier) terminus. The Pike Pier is a triumph of preservation for us, as are the other “Gold Rush Piers” that still line up behind the photographer of this scene – and so behind Jean too. Both the “now and then” were snapped from the water end of Pier 57, the old Milwaukee Railroad pier. All of the old piers follow the angle into the bay prescribed for them in 1897, although all were built in the early 20th Century. The wealth got from warehousing and wharf rates during the gold rush of the late 1890s allowed the dock owners to build these conforming and bigger piers after the greatest excitement of the rush settled down – although some gold fever continued with the rush to Nome during their construction. The Pike Pier was planned in 1903 and completed a year later by Ainsworth and Dunn. They also rented space to both the steamship line and the Mt. Vernon farmer Willis Wilbur Robinson, whose name is writ large along all sides of the Pike Pier. Robinson stuffed Skagit River sternwheelers with hay for delivery to the Pike Pier, until railroads did the hauling cheaper. About 1911 Robinson’s block letters were replaced by ones for a steamship agent named Dodwell. Ainsworth and Dunn sold fish primarily. They started the move of fish merchants to the north end of the central waterfront in the mid 1890s. 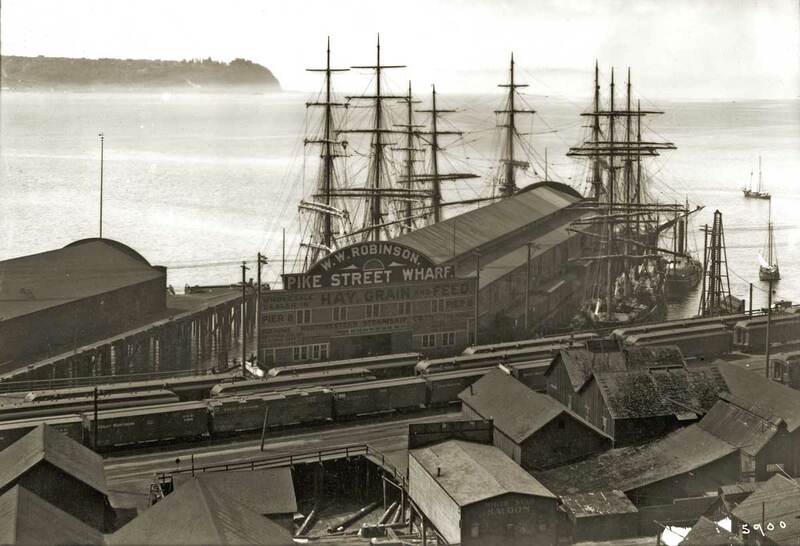 Before their lead most fish commerce was handled south of Yesler’s Wharf. 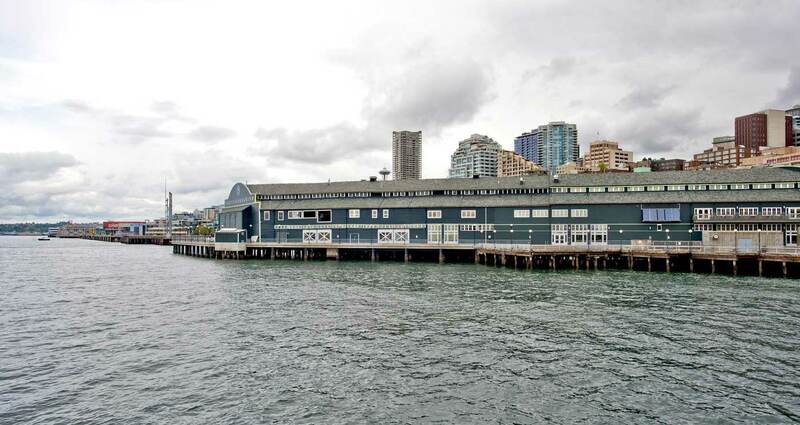 In 1916 Dodwell was replaced by Pacific Net and Twine Company, and from then until after World War Two, Pike Pier was home for fishermen and the professionals who serve and represent them. Persons who have been paying attention to credits for the historical photos (including this week's) used in now-and-then will have seen the name Lawton Gowey a few score times. Lawton and I studied piles of images together now many years ago. He died in the mid 1980s when preparing to play the organ at church as he had done almost every Sunday for decades. 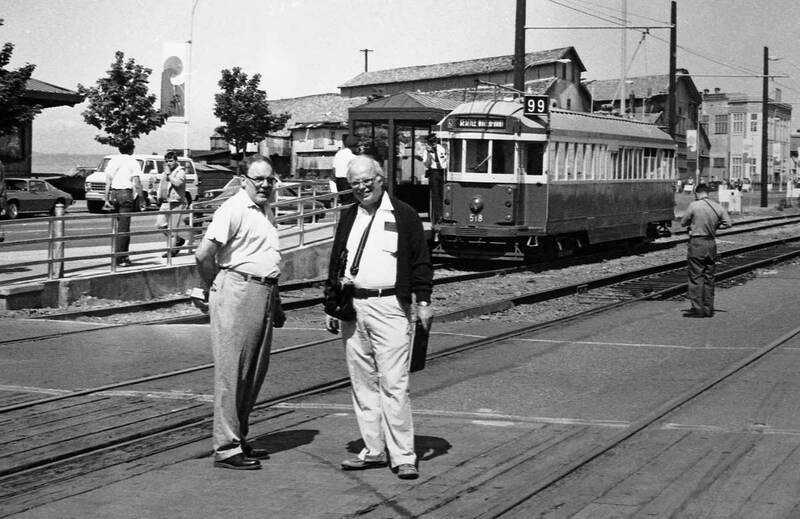 Here's Lawton most likely on the day of the waterfront trolley's inauguration, May 29, 1982. He was a rail fan his entire life. The inaugural trolley #99 is behind him. I recognize the friend on the left but do not know his name. Lawton has his 35mm camera hanging from his neck and he is - typically - smiling. They are standing at the foot of Pike Street. I don't know who took this photograph, but thank her or him. The humbled wreckage of the original Pike pier - the one for coal built in 1871-72 and abandoned in 1878 for the King Street Coal Wharf and bunkers. This view looks north from the end of the King Street wharf and shows both Denny Hill (its two humps) and part of Queen Anne Hill on the horizon. Courtesy U.W Library. Frank Shaw's recording of the water end of the Pike Pier before its makeover for the Seattle Aquarium. Shaw has dated this view July, 31, 1974. Some construction on the Waterfront Park is apparent south of the Pier. 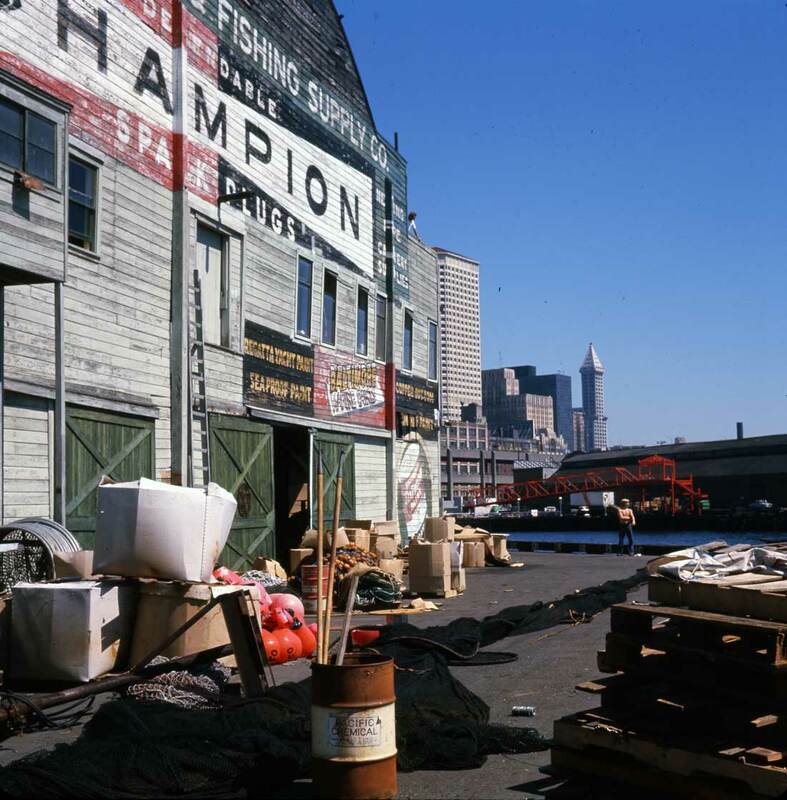 An early view of the Pike Pier when it's primary tenant was the grain merchant Robinson. Part of the Schwabacher pier is evident on the left. West Seattle's Duwamish Head is on the left horizon. 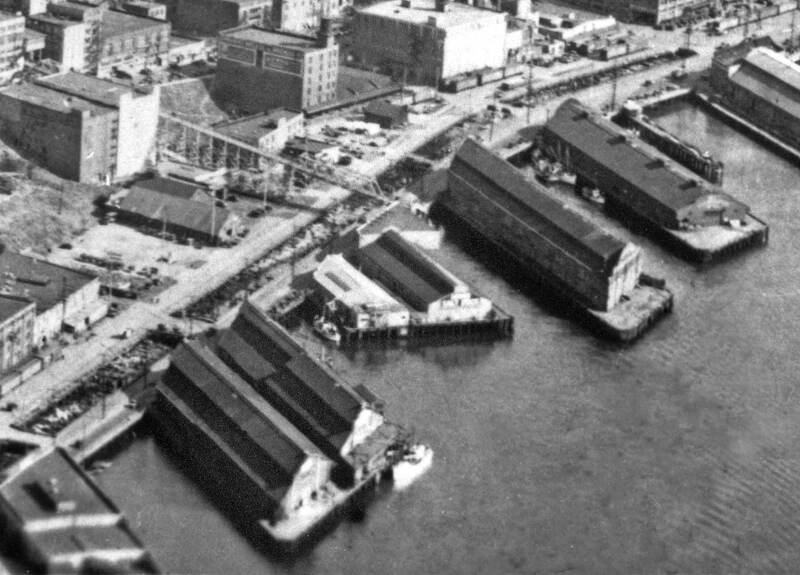 A circa 1934 aerial of the Pike Pier's section of the central waterfront. The Lenora Pier is at the bottom-left corner. Next - to the right - comes the nearly twin piers at the foot of Virginia Street. Then two smaller "fish and salt" piers, followed by the Pike Pier, the Schwabacher Dock, a narrow "Wellington" dock for loading coal and part of Pier 57 from which Jean and the historical photographer both took their views of the Pike Pier shown near the top of this feature. The 1934-36 construction of the seawall between Madison and Bay streets is not yet underway. Note the running gap ("dangerous death trap") in the Railroad Avenue planking. And there's the Pike Street pedestrian trestle again. It was featured in last week's "now and then." 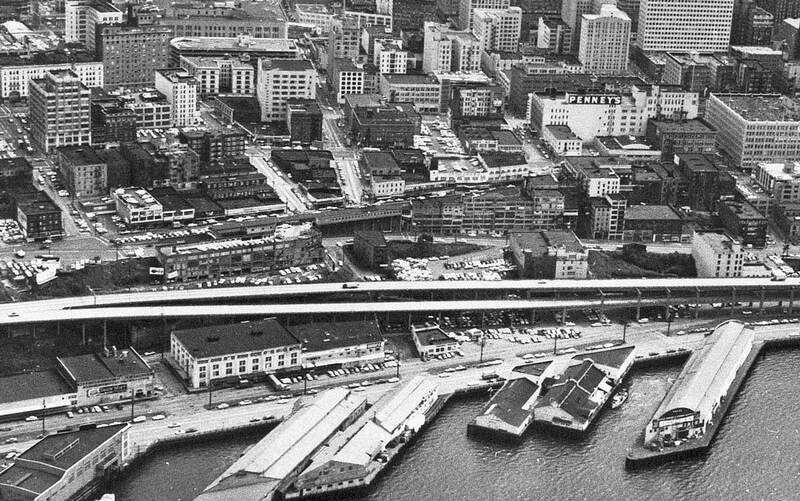 Another aerial - this one with the viaduct. Pike pier is far right. The subject is dated June 7, 1968, the year of the Forward Thrust bond that would help fund both the Waterfront Park and the Aquarium. The Dode is tied to the Pike Pier in the slip between it and Schwabacher. The year is ca. 1911. A 2003 look at the Central Business District skyline from one of the Waterfront Park "trestles" attached to the Pike Pier.